This is another AV8RSTUFF creation for the VFA-34 "Blue Blasters". This is the TWO-ROCKER version (above and below) of their 2018 "LAST HORNET CRUISE" before they transition to the F-35 after this deployment. This is an incredibly detailed, stitched patch with the text "LAST HORNET CRUISE CVN-70" (top) and 1996-2018 (bottom) with a lot of other details in it. Definitely, a MUST HAVE patch......no velcro on the back. This is another AV8RSTUFF creation for the VFA-34 "Blue Blasters". This is the ROUND version (above and below) of their 2018 "LAST HORNET CRUISE" before they transition to the F-35 after this deployment. This is an incredibly detailed, stitched patch with the text "LAST HORNET CRUISE CVN-70" (top) and 1996-2018 (bottom) with a lot of other details in it. Definitely, a MUST HAVE patch......no velcro on the back. 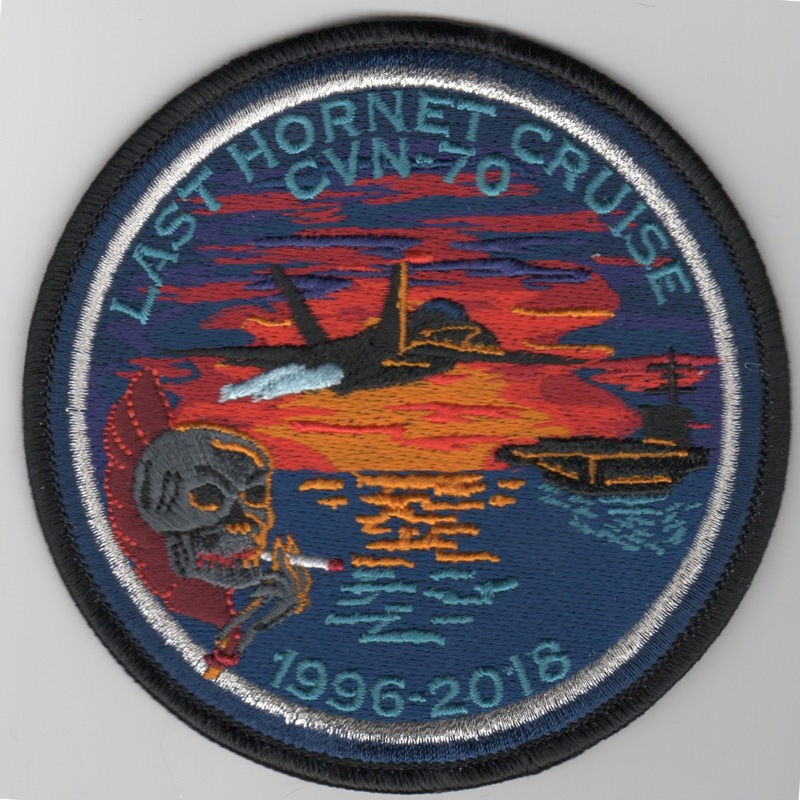 Use this link to get both "LAST HORNET" cruise patches with a discount. Another AV8RSTUFF creation for the VFA-34 "Blue Blasters". This is the round, 3" bullet version of their 75th Anniversary patch depicting their lineage and heritage aircraft. This patch does not come with velcro. 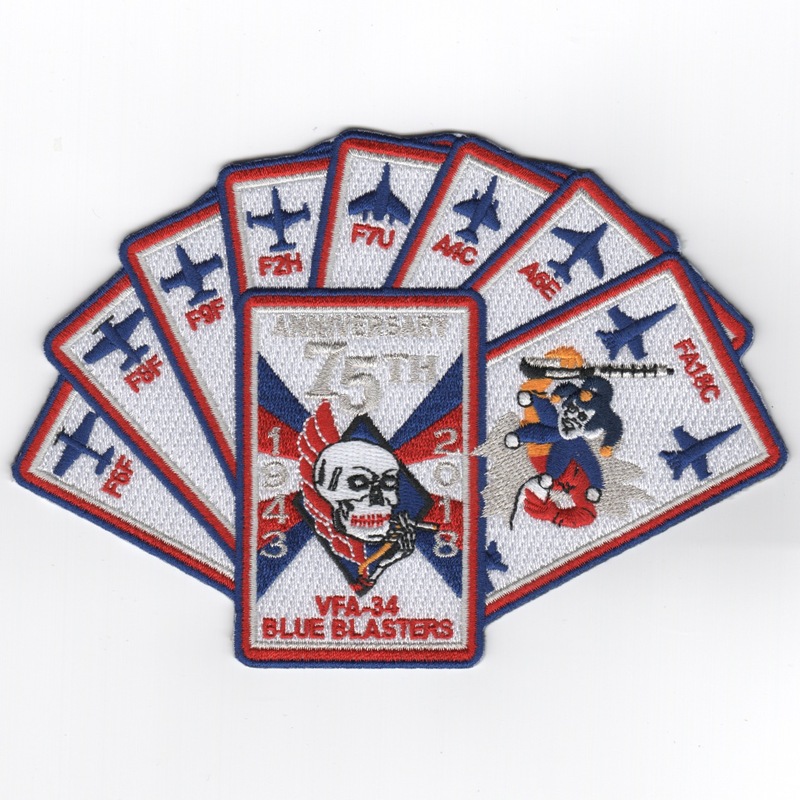 Use this link to get one of each of the "card", "4-inch", and "3-inch" versions of the Blue Blaster's 75th anniversary patches shown above at a discount. Another AV8RSTUFF creation for the VFA-34 "Blue Blasters". 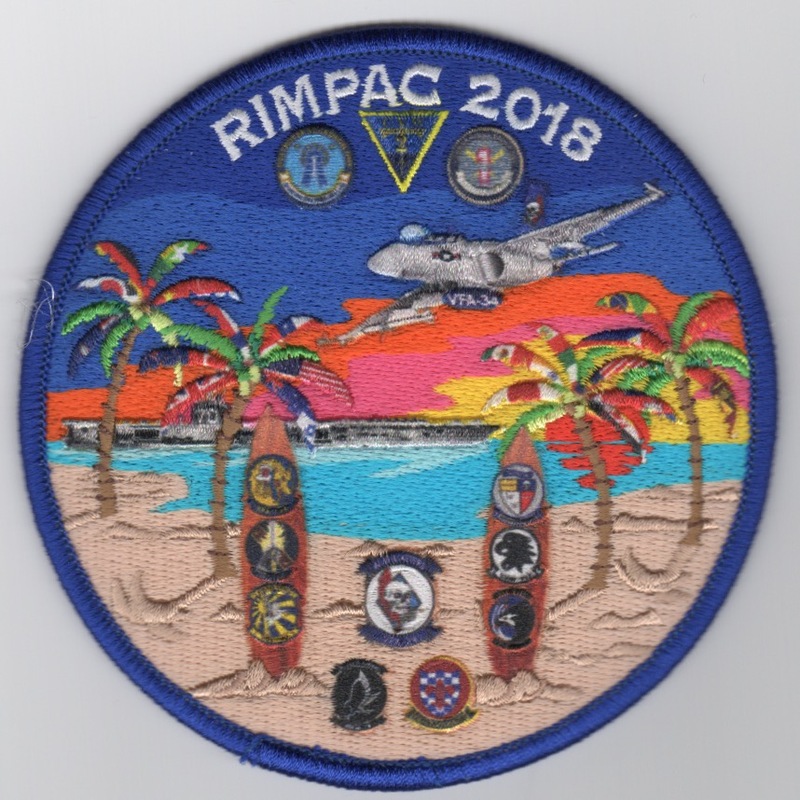 This is their 2018 'RIMPAC' patch created using the new "hybrid" technology giving incredible detail. It shows the squadron logos from the Airwing on the surfboards, with the beach scene, palm trees and carrier in the bay. The leaves of the palm trees are the flags of the countries they had port-calls in. Very detailed patch, and does not come with velcro. This is another AV8RSTUFF creation of the VFA-34 "Blue Blasters" F-18 Tailfin. It shows their mascot logo on the tail, with "400" at the top. This patch does not come with velcro. 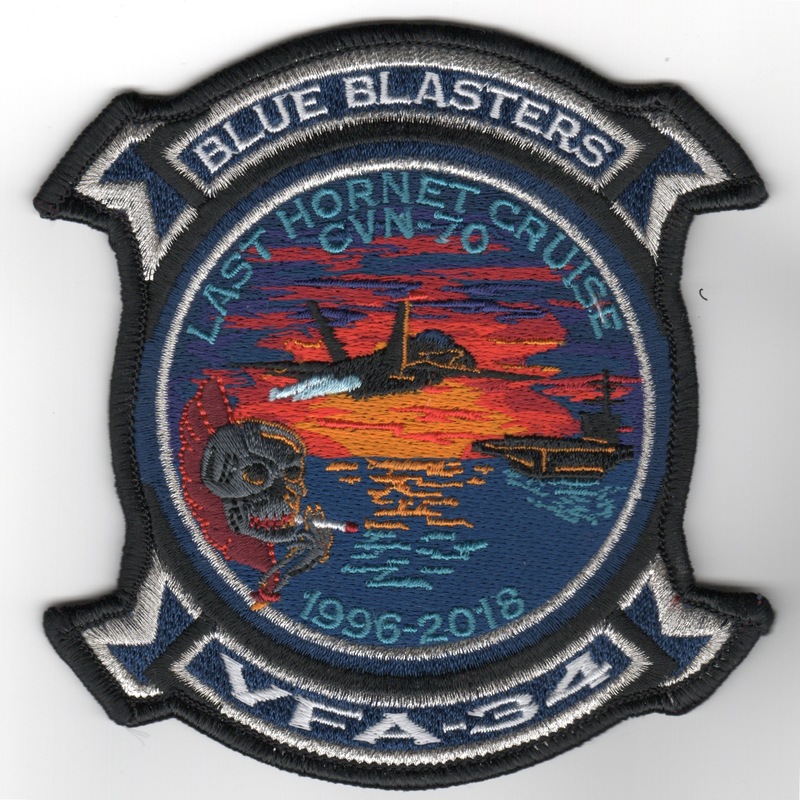 This is another AV8RSTUFF creation for the VFA-34 "Blue Blasters" for their final 2018 Hornet cruise. 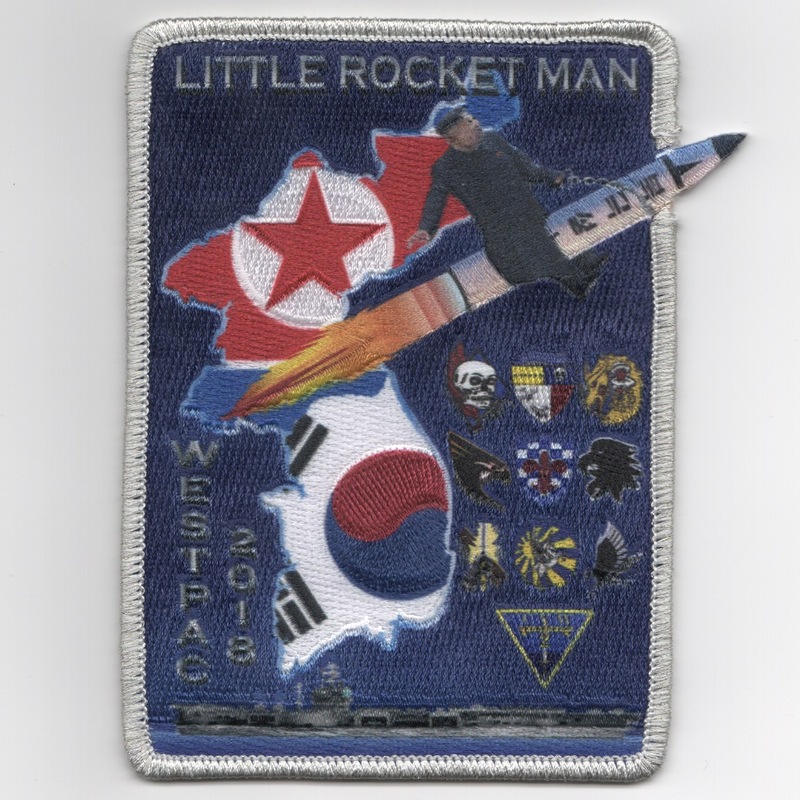 This patch depicts the NOKO leader riding a rocket, as per the title given him by POTUS Trump of "Little Rocket Man". It also shows the squadron logos for the Airwing (CVW-2) with the Korean Peninsula as the backdrop. 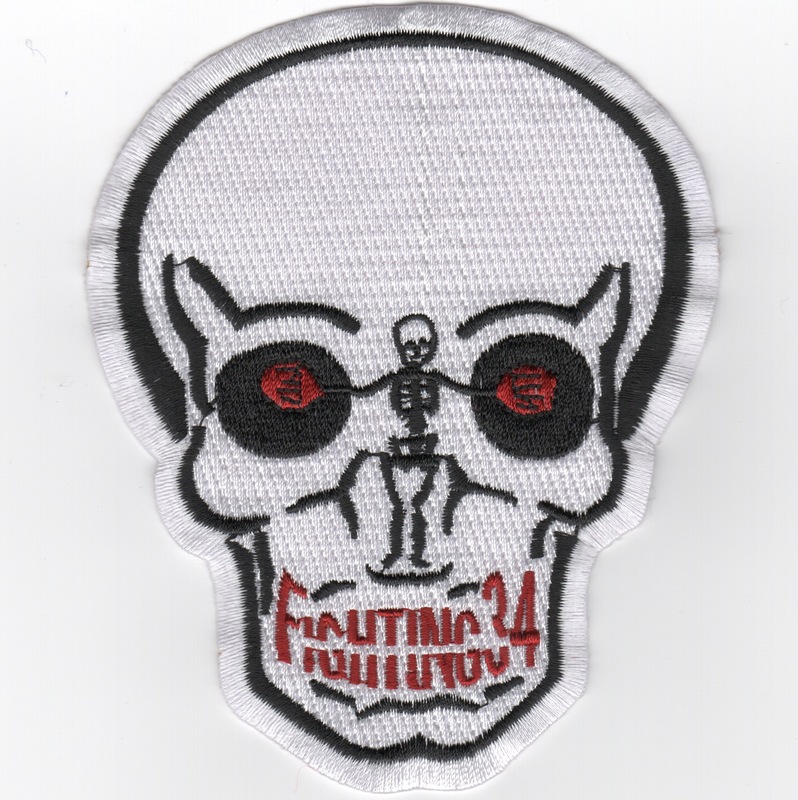 Definitely, another MUST HAVE patch...... no velcro on the back. 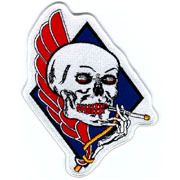 Receiving their first A-6E Intruders in April 1970, the squadron had already been using this patch design since 1966. They were transitioned to the F/A-18C Hornet in late 1996 after return from their Med cruise aboard the USS Washington in CVW-17. They are now based at NAS Oceana, VA. Notice the Landing Signal Officer (LSO), with "paddles", on face of skull. Receiving their first A-6E Intruders in April 1970, the squadron had already been using this patch design since 1966. They were transitioned to the F/A-18C Hornet in late 1996 after return from their Med cruise aboard the USS Washington in CVW-17. They are now based at NAS Oceana, VA. Notice the Landing Signal Officer (LSO), with "paddles", on face of skull. The design was changed to a more uniform shape that most Hornet squadrons are now adhering to. Receiving their first A-6E Intruders in April 1970, the squadron had already been using this patch design since 1966. They were transitioned to the F/A-18C Hornet in late 1996 after return from their Med cruise aboard the USS Washington in CVW-17. They are now based at NAS Oceana, VA. Notice the Landing Signal Officer (LSO), with "paddles", on face of skull. The design was changed to a more uniform shape that most Hornet squadrons are now adhering to. This is the "subdued" gray version worn on the desert flight suits. The "Blue Blasters" received their first A-6E Intruders in April 1970. They were transitioned to the F/A-18C Hornet in late 1996 after return from their Med cruise aboard the USS Washington in CVW-17. The "Blue Blasters" received their first A-6E Intruders in April 1970. They were transitioned to the F/A-18C Hornet in late 1996 after return from their Med cruise aboard the USS Washington in CVW-17. This is the "subdued" gray version of the aircraft bullet they wear on their desert flight suits. The "Blue Blasters" received their first A-6E Intruders in April 1970. They were transitioned to the F/A-18C Hornet in late 1996 after return from their Med cruise aboard the USS Washington in CVW-17. This is the desert version of the aircraft bullet they wear on their desert flight suits. 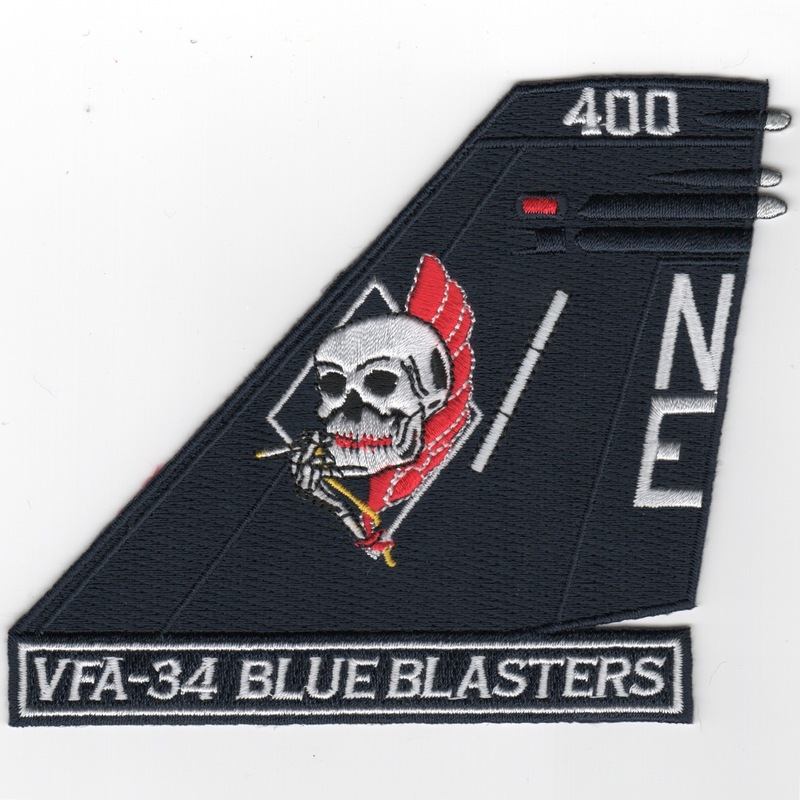 This is the blue/white version of the "Friday" patch for the VFA-34 Blue Blasters worn only by the aircrew. It shows their 'mascot' (a joker) wielding an instrument of destruction. 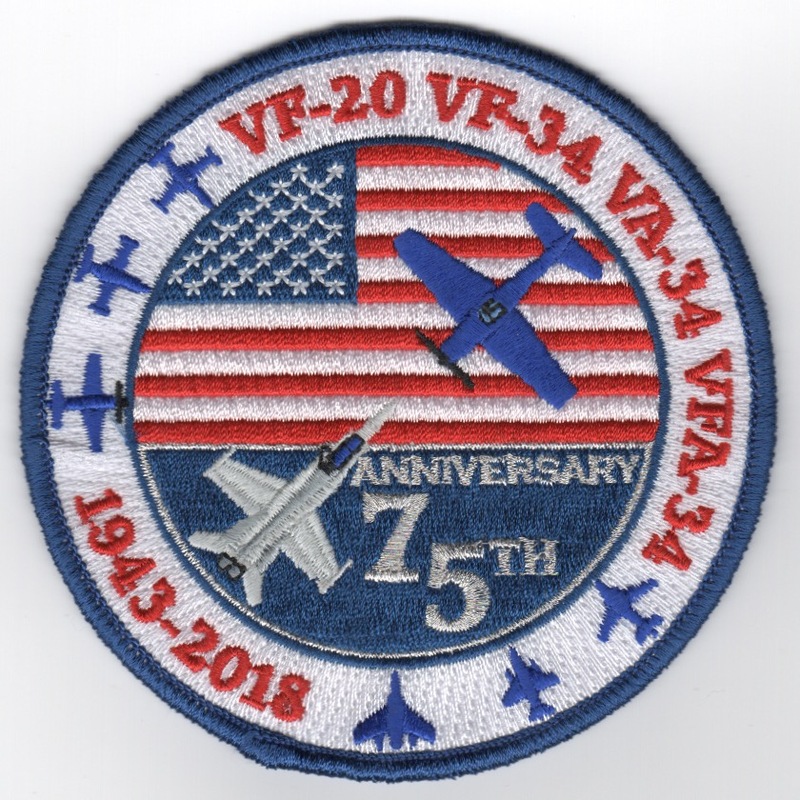 According to 'The Hook' (Tailhook's magazine), the VFA-34 "Friday" patch with the joker on the cards is VF-20s WW II first cruise (1944) insignia. 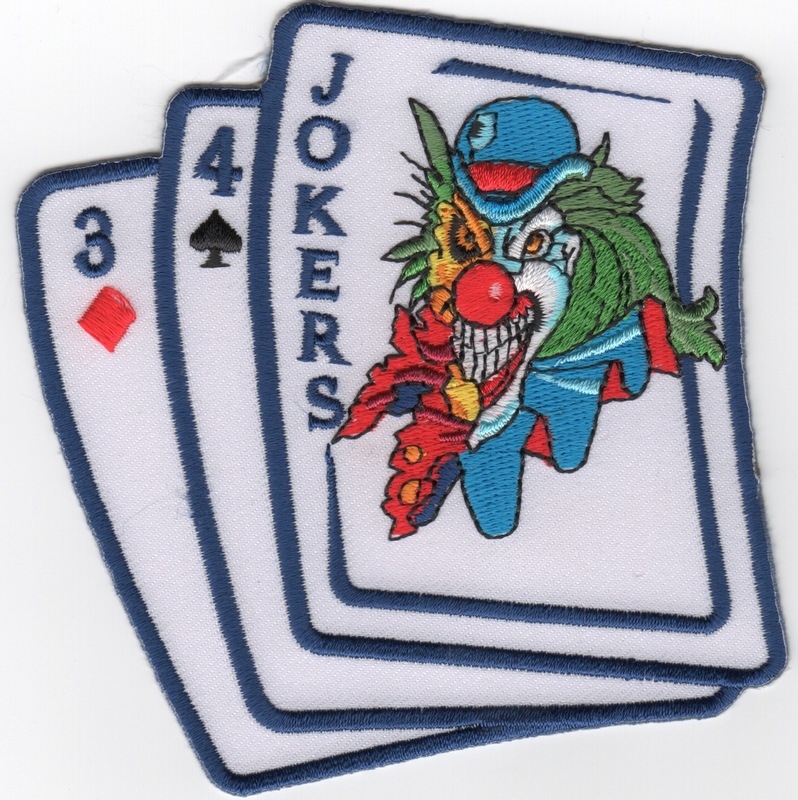 This is the multi-colored version of the "Friday" patch for the VFA-34 Blue Blasters worn only by the aircrew. It shows their 'mascot' (a joker) wielding an instrument of destruction. 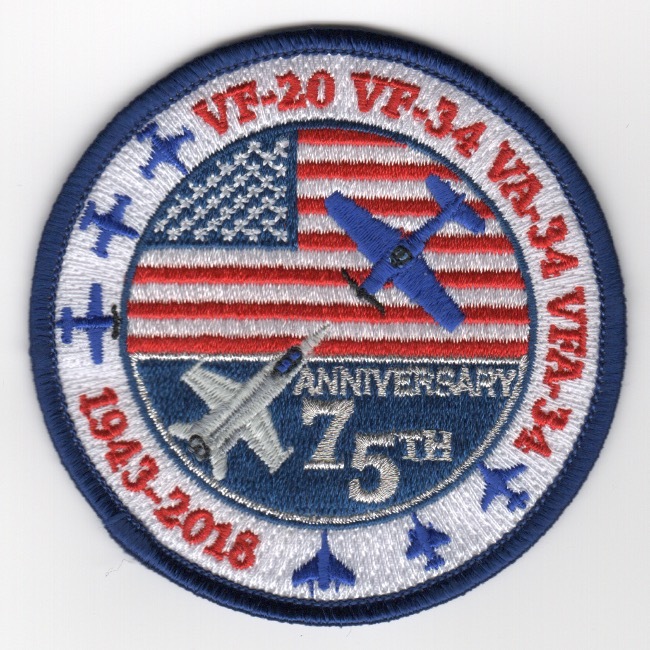 According to 'The Hook' (Tailhook's magazine), the VFA-34 "Friday" patch with the joker on the cards is VF-20s WW II first cruise (1944) insignia. 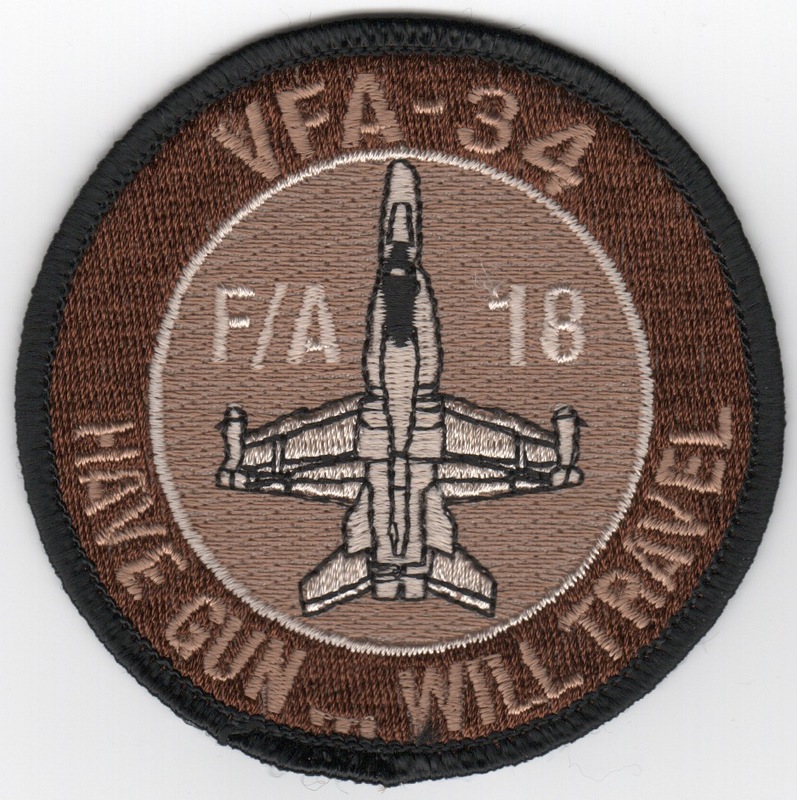 Homepage | Order VFA-34 Patches!